Hello again! I’m afraid I haven’t touched Project Prophecy since the last Ludum Dare compo but I have continued to tinker around with Flash things. This weekend was Mini-Ludum Dare #37: I hadn’t especially planned to enter but the theme called out to me. Not making a game; or more accurately, making a not-game. A chance to forget reward mechanics and arbitrary challenges in favour of crafting a specific and personal experience for the player (if we still call him or her that) to take in. As you may not be aware I have always held something of a fascination with space and the universe: I actually studied a masters degree in Physics with Astrophysics while I still decided what to do with my life. And while I’ve long forgotten most of the hard maths I tried to absorb those years ago, this vague fascination formed the basis of the game I made this weekend. 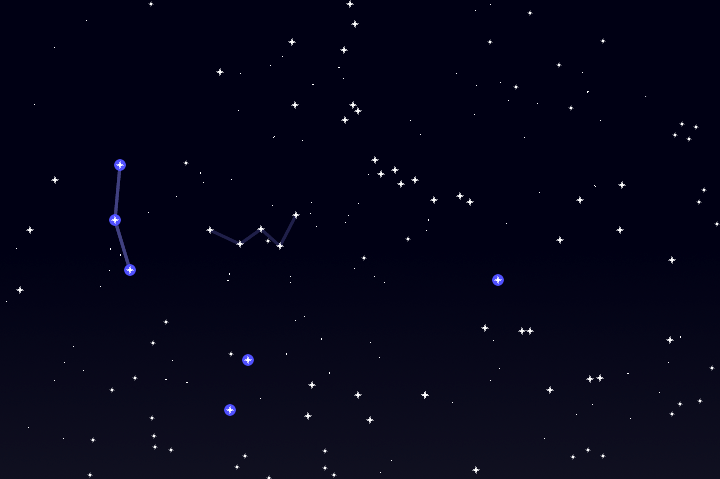 In it you are presented a fairly accurately mapped section of the Northern Hemisphere sky (thanks to this neat site) where you can pick out constellations amongst the stars. There is a little incidental dialogue from the out-of-shot stargazing couple to accompany your little exploration. I’m quite pleased with it really, I hope it can prove a pleasant distraction!